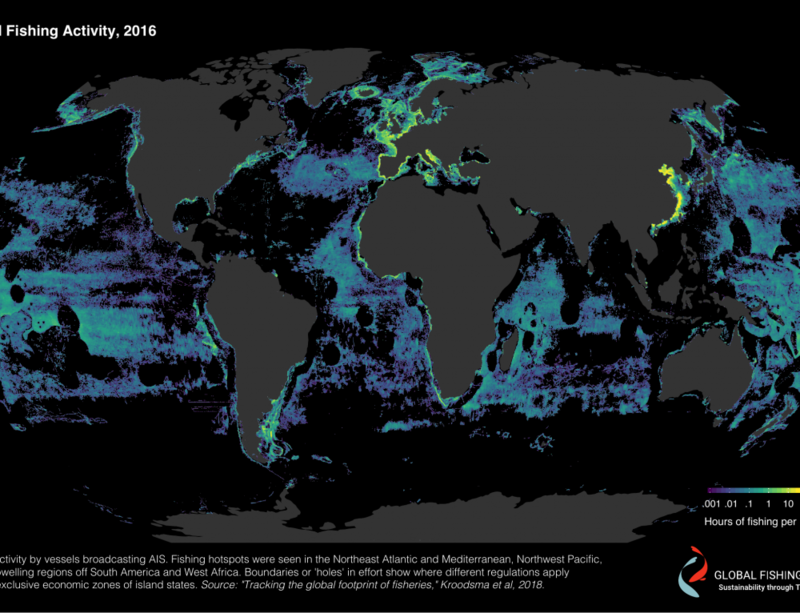 One of the main outputs of the Global Fishing Watch project is the interactive map of global fishing. This map presented some particular challenges to implement. This blog post is about these challenges and our solutions to them. Vessel tracks are derived from time series data, that is, ordered points, each of which each have a latitude, longitude and timestamp. The data is generally sparse, often with long gaps due to satellite coverage, meaning that for most positions along the track, most of the time, there is no vessel. Tiled server side rasterization on the other hand does not have any size limitations beyond your server farms capacity. And even that is not a hard limit as you can either pre-generate all tiles, spending whatever time necessary to do so, or generate tiles and cache them on the fly depending on your specific data and usage patterns. We chose to do a hybrid approach – rendering client side, but using tiling. That is, our tiles contain vector data. At lower zoom levels the tiles can not contain individual track points, but rather clusters of points. We used two different clustering methods: First we cluster in time inside each track, resampling the tracks to lower precision in time. If that is not enough to get the tile content below a predefined size limit, we then cluster spatially for each time point, across vessels. This approach does require that all processing be done in WebGL. This includes both styling, mapping from tile data to visualization parameters, and point filtering (e.g. handling the currently selected time window or user defined filters like vessel flag states or gear type). We used a variant of a technique called WebGL picking to handle mouse interactivity. In this technique, objects are rendered in an offscreen buffer using a unique color for each object, so that the object under the mouse pointer can be deduced by reading back the pixel color. Our variant doesn’t render the whole scene, but rather only a 100×100 pixel square around the mouse pointer (using WebGL clipping), caching the results between mouse moves unless the visualization parameters have changed. This minimizes the sum of the draw time and the time to read the pixel values back from the graphics card. A spatial tiling system consists of a pyramid of tile grids at all available zoom levels. A full temporal tiling system using the same approach would require a very large set of tiles. The usage patterns of such a tile cube would however be very sparse because most tiles would only be requested by a very small number of users. We used a normal spatial tiling with a pyramid of tiles in sizes ranging from the whole world to very small regions, but only one temporal slice / tile length – one month. We used a dynamic spatial zoom level to emulate the effect of a full temporal pyramid for each spatial zoom level. The zoom level for the spatial tiles depend both on actual spatial zoom and the temporal zoom: The number of spatial tiles to divide the screen into is divided by the number of temporal slices needed to cover the cuorrent time window.